What influences dentists to participate in Medicaid or the Children’s Health Insurance Program (CHIP)? One might assume determining factors would include reimbursement rates, the extent of services covered, local competition trends, and the number of low-income patients in the community. Certainly, all may have a bearing — but, as data from the American Dental Association Health Policy Institute show,1 it is not easy to draw correlations between participating in Medicaid and CHIP and any single factor. Reimbursement correlates somewhat, but not nearly to the extent it does for physicians.4 For example, Iowa has the highest dentist participation rate in the country at 85.5%,1 but its Medicaid reimbursement rate is only 40.4% of the usual fees and 49.1% of private insurance reimbursement.4 The scenario is nearly the same in North Carolina (43.7% and 52.9%, respectively),4 where the participation rate is 29.7%1 — nearly 10% below the national average. The reasons dentists participate in these programs are complicated and, presumably, affected by localized factors, including the specific payer-makeup of patients, trends in local competition, reimbursement rates, and even the practice philosophy and life stage of the provider. American Dental Association Health Policy Institute. Dentist Profile Snapshot by State 2016. Available at: https:/​/​www.ada.org/​en/​science-research/​health-policy-institute/​data-center/​supply-and-profile-of-dentists. Accessed December 17, 2018. Families USA. A 50-state look at Medicaid Expansion. Available at: https:/​/​familiesusa.org/​product/​50-state-look-medicaid-expansion. Accessed December 17, 2018. U.S Census Bureau. Income and Poverty in the United States: 2017. Available at: https:/​/​www.census.gov/​library/​publications/​2018/​demo/​p60-263.html. Accessed December 17, 2018. American Dental Association Health Policy Institute. Medicaid Participation and Reimbursement for Physicians and Dentists in Every State. Available at: https:/​/​www.ada.org/​en/​science-research/​health-policy-institute/​publications/​webinars/​medicaid-participation-and-reimbursement-for-physicians-and-dentists. Accessed December 17, 2018. American Dental Association Health Policy Institute. 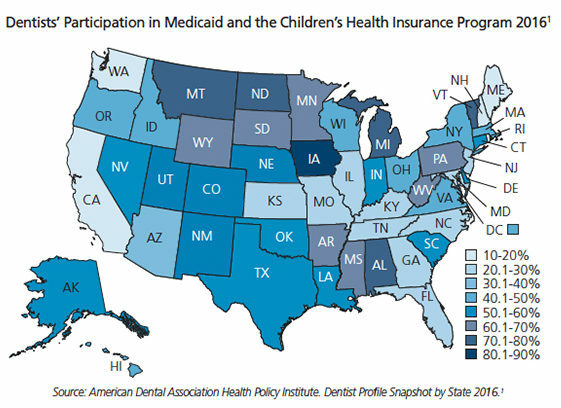 Dentist Participation in Medicaid or CHIP. Available at: https:/​/​www.ada.org/​~/​media/​ADA/​Science%20and%20Research/​HPI/​Files/​HPIGraphic_​0217_​1.pdf. Accessed December 17, 2018. U.S. Department of Health and Human Services. Designated Health Professional Shortage Areas Statistics. Available at: https:/​/​ersrs.hrsa.gov/​ReportServer?/​HGDW_​Reports/​BCD_​HPSA/​BCD_​HPSA_​SCR50_​Qtr_​Smry_​HTML&rc:Toolbar=false. Accessed December 17, 2018. From Decisions in Dentistry. January 2019;5(1):46.